Several years ago I read Karen Blumenthal’s Steve Jobs: The Man Who Thought Different. I almost didn’t finish the book because I found Jobs so off-putting. expecting to feel the same anger and irritation at Jobs. Although Hartland talks about Jobs’ difficult relationships with people, I enjoyed this graphic biography immensely. 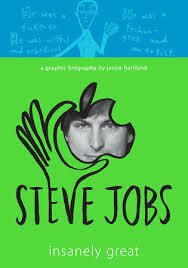 The text really focuses on Jobs as an innovator and reveals his innovations by repeating the book’s subtitle: “insanely great”. The book follows Jobs’ life in chronological order, but pages are arranged creatively, sometimes with two or three cells per page, sometimes with only one. Hartland’s simple black & white line drawings make his life interesting and even entertaining. One of the real strengths of the book is that it does not assume readers know about the technologies that predated personal computers. One and two-page spreads explain “old” technology like arcade games, the history of the computer and how records had to be played on record players. All this is cleverly tied into Jobs’ great desire to make technology better and more beautiful. The overall impression I have from this book is that, for good or ill, Steve Jobs was a man who had a vision and would do whatever it took to implement it. You might not admire his style, but it certainly left me admiring his tenacity in adhering to his ideals. 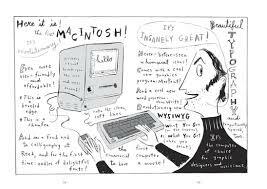 This graphic biography would be a great introduction to the life of Steve Jobs. It also includes a bibliography in case readers want to learn more about the Apple co-founder. 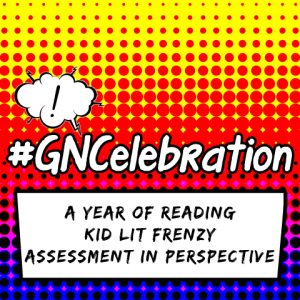 If you enjoyed reading this post, please check out the other graphic novels recommended during October’s Graphic Novel Celebration. 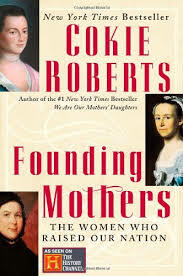 About 10 years ago, Cokie Roberts published Founding Mothers: the Women Who Raised Our Nation. 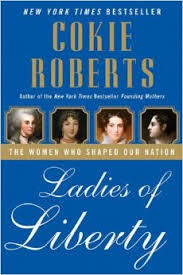 She followed it in 2008 with Ladies of Liberty: the Women Who Shaped Our Nation. 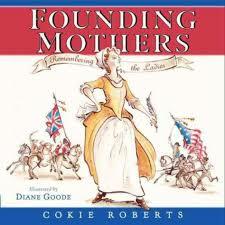 Last year, she published a children;s version of these two books, Founding Mothers: Remembering the Ladies. I picked this up to beef up our biography unit and I am using it today to talk about introductory paragraphs and opening sentences. At the time of the American Revolution, of course there were no radios, televisions, or computers. So politicians depended upon newspapers and pamphlets to spread the message. One of the most important writers arguing for independence from Britain was Mercy Otis Warren. The kids are in various stages of writing and researching. This is never a clean and neat progression of tasks. But I hope, wherever they are int he process, this mini-lesson will stick. 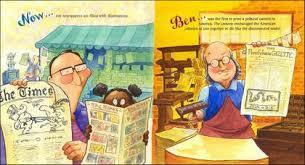 I’m currently thinking of revamping my biography unit. This is always daunting because it is so easy and comfortable to do things the way they’ve been done before. But I think this is a necessary step to take to make it better for both the kids and for me. 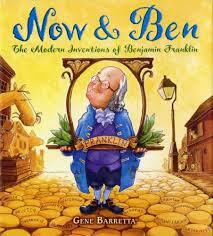 I am always on the lookout for good biographies, either chapter books or picture books. It’s the writing that matters. And I’ve found a trio of good ones. 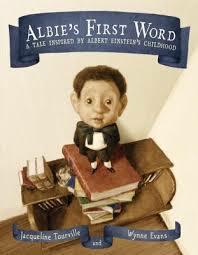 Albie’s First Word, by Jacqueline Tourville and Wynne Evans, is a fictionalized account the oft hear tale of the young Albert Einstein who didn’t talk until after he’d turned three. The book goes through the concerns Einstein’s parents had that compelled them to take young Albert to a doctor, who prescribes experiences like taking him to the symphony and exposing him to new places, people and things. The illustrations give context and Albert’s eye are riveting. You can see the wisdom and curiosity in them that will turn Albie into Albert Einstein. The endpapers are pages from Einstein’s actual notebooks and the Author’s Note provides more detailed biographical information. Star Stuff: Carl Sagan and the Mysteries of the Cosmos by Stephanie Roth Sisson follows Carl from his days star-gazing from the bedroom window of his Brooklyn apartment, through his love of speculative science fiction novels, to his work as an internationally renowned scientist who worked on the Voyager missions exploring the farthest reaches of space. The back matter in this book includes an Author’s Note, a bibliography, and source notes. Fortunately, there aren’t billions & billions of them. ha ha. Finally, for older or more confident readers we have a new biography of Sally Ride. 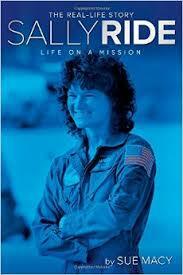 Sally Ride: Life on a Mission by Sue Macy goes beyond her role as an astronaut. Did you know that, in her lifetime, she was also a nationally ranked tennis player, a physicist who enjoyed reading Shakespeare, a university professor, the founder of a company that helped inspire girls and young women to pursue careers in science and math, and a recipient of the Presidential Medal of Freedom? A readable biography and an excellent example of a woman who excelled in Science & Math. 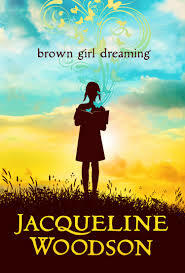 In her author’s note at the end of Brown Girl Dreaming, Jacqueline Woodson says simply “Memory is strange”. And free verse, a form in which Wooodson is very comfortable, seems to be the perfect vehicle for her memoir. Her voice is so clear in my head and so engaging that I couldn’t put the book down, finishing it in one sitting. The book is tender, heart-breaking and inspirational, full of love, family and place. Place is almost a character here. Although Woodson was born in Ohio in 1963 and spent much of her youth in South Carolina before her family moved to Brooklyn. 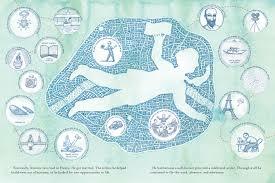 Each of these places is beautifully evoked and you can see how each had their influence on the burgeoning writer. As much is this memoir is about writing, it is the parts about listening I find most interesting. There are a series of short, numbered haikus throughout the book. As Jacqueline and I moved through the book together , I noticed how they change. The memoir is full of family stories, and variations of family stories, as in the story of Jacqueline’s birth, that different people remember in different ways. This is a beautiful book I hope you all take the opportunity to read. 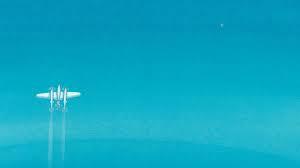 When they hear the name Antoine de Saint-Exupéry, most people think of his book The Little Prince. I read it in Grade 13 French with Monsieur Esders. 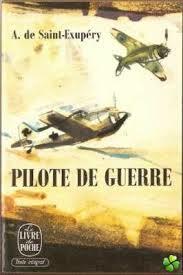 My favorite Saint Ex novel has always been Pilote de Guerre , translated as Flight to Arras). I have to admit, and I don’t say this to be pretentious, but I prefer to read Antoine de Saint-Exupéry in French. Pilote de Guerre is memoir of his time as the pilot of a reconnaissance plane during the Battle of France in 1940, and condenses months of flights into a single mission over the town of Arras. Although it is about events, it is a reflection on war that was written, in part, to encourage the Americans to enter the war. 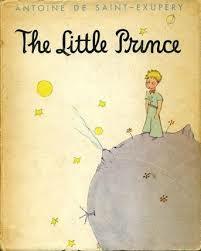 The Little Prince was published a year after Pilote de Guerre. 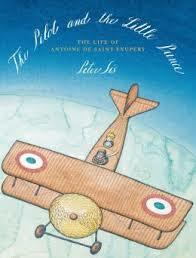 This year, Peter Sís has written an excellent picture book biography of Antoine de Saint-Exupéry. The Pilot and the Little Prince connects Antoine de Saint-Exupéry’s birth in 1900 to the sense of adventure and unlimited potential that the new century brought. Fascinated by planes a little boy, he became one of the first pilots to fly mail, creating new routes in far away places. He even crashed in the desert, an event that became the inspiration for the story of The Little Prince. It covers his time in America as well as his role fighting for France. And it ends with his disappearance. 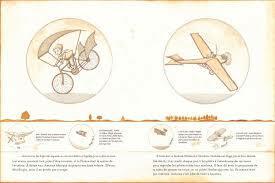 The story os good, but it is Sís’ illustrations that capture the energy and imagination of Antoine de Saint-Exupéry. 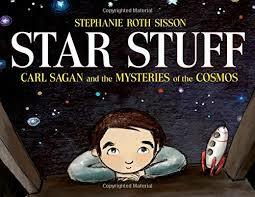 A picture book well worth picking up. I hope it will fuel your imagination. It is a busy time of year. I’m knitting gifts, working full time, making sure Fiona gets her meds & ears cleaned on schedule, doing OBHR volunteer work. Sometimes it is hard to find time to read. It feels like a juggling act some days: an hour of housework , a dog walk and then I can read. Okay, finish the next row of knitting, clean the kitchen, then I can read. Sigh. So, I tend the read shorter chapter books & more picture books. The stack of YA materials is just going to have to wait. Fortunately, I always have book on in the car. 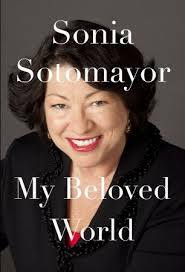 Earlier this year I listened to My Beloved World by Supreme Court Justice Sonia Sotomayor. If you have not read this you should. She grew up like a lot of kids at my school: poor and Latino. But it is the resilience she shows, her grit, that helps her succeed. I’ m trying to figure outs how to cultivate that in my students. This was narrated by Rita Moreno, who was the perfect voice for the story. Right now I’m listening to The Boys in the Boat by Daniel James Brown. This is another MUST READ. 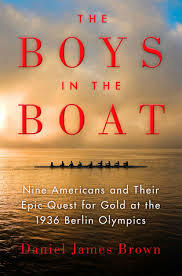 The boys in the boat that won gold at the 1936 Berlin Olympics were mostly poor kids, too. But, again, it was their grit and perseverance that helped them excel. This is narrated by Edward Hermann who has a beautiful voice. They boys have just started their sophomore year and I’ve already cried at least once. The story of Joe Vance has me enthralled. he had a horrible life. But he had an epiphany at 15: if he was to succeed it was all on him. He’d just been abandoned on his family’s farm and lived there alone, working and going to school. His resilience in the face of defeat is awesome. What made him succeed where others would have collapsed? How do we instill this sense of purpose in kids? How do we make them more resilient? This is what these books have me pondering. Both of these are books for adults, although I think a lot of young adults might be inspired by them, too. Think about adding them to someone’s holiday gift list.